Community members held signs with inscriptions such as '#ResistRacism' and 'I stand with my Jewish siblings'. Yesterday morning, the campus and community awoke to startling news. During the night of Nov. 14, four storefronts along S. Superior Street as well as other buildings and landmarks downtown were graffitied with images depicting racist and white supremacist ideology, such as swastikas and the symbol for the KKK. The vandalism, when discovered, drove both the community and the campus into immediate and decisive action. According to Albion Public Safety, the vandalism was most likely done by a group of teens or young adults in the area, and it points out that many of the swastikas and other symbols were drawn incorrectly. Because of these clues, Public Safety believes one possibility is that these vandals could be pulling a prank for attention, and thus these vandalisms might not necessarily represent the same values these symbols represent. The symbols were painted on storefront windows, along the sides of buildings on Superior Street, and even on the walls of the nearby Epistolary church. Mayor Joe Domingo ordered Albion Public Works to halt all other work and immediately scrub and remove the graffiti. Paint was donated by the Albion Paint Spot to cover the symbols that could not be scrubbed off. While most of the graffiti was removed by mid-morning, some of it remained up for most of the day until it was removed later by a group of volunteers. 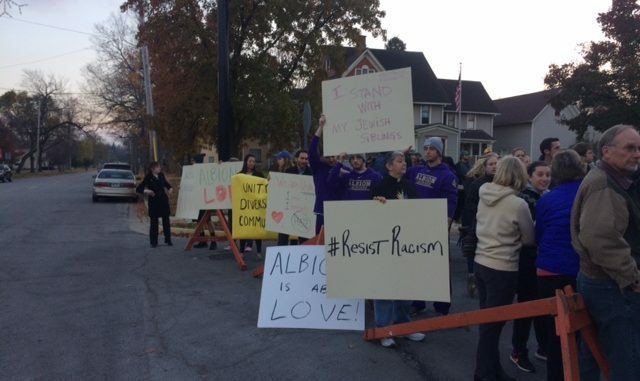 Albion College President Mauri Ditzler sent an email to all faculty and students yesterday morning at 10:42, even though Ditzler himself was off campus the day of the crime. In his email, Ditzler stated the college “rejects the expressions of hatred” that were graffitied. “The ugly symbols we found today and the messages they convey serve to remind us that this is a time to express our support and love to all members of the campus and local community who are feeling particularly vulnerable in this time of uncertainty,” said Ditzler in his official statement. By 1:30 p.m. that day, Dean of Students and Vice President of Student Affairs Sally Walker sent another email to all of the college informing them of another event happening downtown. This time, however, instead of the email bearing bad news, it contained a bit of good news in the community. College Chaplain Reverend Donald Phillips, who is also a prominent community and religious leader, organized a unity rally for the campus and community. The news of the unity rally spread rapidly among the professors and to the students and even on social media sites. Classes were canceled, student organization meetings were rescheduled and all students were encouraged to attend the unity rally. City Manager Sheryl Mitchell referred to the unity rally as part of a “healing process” when asked for comment. She and many other members of Albion’s city government were in attendance that evening at the rally. Robert Joerg, a sophomore from Fremont, Ohio, and president of the Albion College Democrats, believes the vandalism is “in direct opposition to our core values of freedom and tolerance and do not represent our nation as a whole.” Joerg is also happy to see the unity rally highlight key issues we face in today’s society. “[These events] will also be key in defeating these ills and making sure everyone in our great country feels welcome and loved,” said Joerg. There were many people in attendance filming the event for Periscope and Facebook Live, and Reverend Phillips acknowledged those people. Numerous Albion College students attended the event, including the entire men’s lacrosse team. Signs were made with phrases such as “Albion chooses love” and “I stand with my Jewish siblings” written on them. The initial shock of the incident left some students feeling unsafe, such as Kalli Allen, a Cleveland sophomore, but it was the reaction of the college and the town that helped them overcome these feelings. According to Reverend Phillips, the unity rally is important because it gives people a space to build community. It’s important to continue to put forward that a community is here and that it can be trusted. When all the prayers, singing and speaking were done at the unity rally, almost all in attendance stuck around to mingle, talk and share their concerns and hopes. Professor Cliff Harris arrived in a #BlackLivesMatter T-shirt and carried a sign during the rally. Harris was optimistic about the event, not only because of how people banded together against signs of hate but also how the campus and community continue to strengthen their relationship through events like these. After the event Harris joined other community members to continue the cleanup process started by Public Works that morning. Some spots of graffiti were accidentally overlooked by the morning crews, and after the rally, other volunteers came together to try and scrub the symbols off of buildings and dumpsters. Even with all the hope and courage preached at the unity rally, some said there was still work to be done. Allen commented on how the college needs to work on the process of “active listening” or rather, listening to understand, not just to respond. Associate Professor Jess Roberts, sporting her own #BlackLivesMatter shirt, also urged that a response to the unity rally and a continuation of the work started here was just as important as the event itself. While Albion Public Safety believes this is an isolated event, it did bring to life very real fears for some people, even if those fears were somewhat soothed by the strong and public display of support shown in Albion yesterday. Anyone who has information about the vandalism can contact Albion Public Safety at 517-629-3933. The Pleiad also reached out to the college Libertarian party and the College Conservatives for comments but they did not respond by press time. Opinion: I Do Not Mind Differences of Opinion. I Do Mind Hate.